And that’s pretty much how I felt for years about Alfredsson. That ‘feeling’ wasn’t helped when we had to play the Senators all those years in the playoffs a decade and more ago. Intense feelings tend to flare up between fans, eh? (Imagine how the players must feel…) Then there was the hit from behind against Darcy Tucker (at least that’s how I saw it) in that pivotal playoff game. It was an edgy, maybe dirty play in the heat of the moment. That Alfredsson wasn’t penalized at all (I thought it should have been a five-minute major and a game misconduct) and immediately scored a key goal, just added insult to injury. Then there was the mocking of our captain and his fellow countryman, Mats Sundin (the infamous fake ‘throwing his stick in the crowd’ routine during a game, after Sundin had done that very thing previously) which further infuriated Leaf fans. Alfie just seemed to be one of those guys that was, as an opposing fan, an easy player to dislike. Maybe we found him annoying, arrogant, whatever. Maybe just that he played for Ottawa. Again, it may not have been fair, but that’s how a lot of fans felt. I have to say, though, the Ottawa captain is one of those guys who I’ve come to respect as the years go by. Sometimes a player sticks around so long that you can’t help but admire the fact that they have been there night after night, in good times and bad, for their team. Alfredsson was a key cog when the Senators “got good” in the early 2000s (after years of being uncompetitive—and worse than that, in their early expansion years). He was marvelous as a Senator in those good playoff years, and especially so when they went all the way to the finals in 2007. The guy has been Ottawa’s Mats Sundin. I don’t know if Ottawa fans will see that as a compliment, but I mean it as just that. He has been the face and the voice of that organization for so long I can barely remember what came before him. He has seen countless teammates come and go and made guys around him better. Beyond the on-ice stuff, you generally don’t hear anything remotely negative said about the guy. He has been committed to the franchise, the fans, the community and has been, in hockey terms, the ultimate loyal solider. It was the Senator captain who, just days ago, went after an opponent and took a major penalty because he believed his Senator teammate took a dirty hit. That’s why it would be sad, in a way, if he finished his fine NHL career somewhere else. Too often, even the very best (heck, Gretzky played for what, four teams in his career? 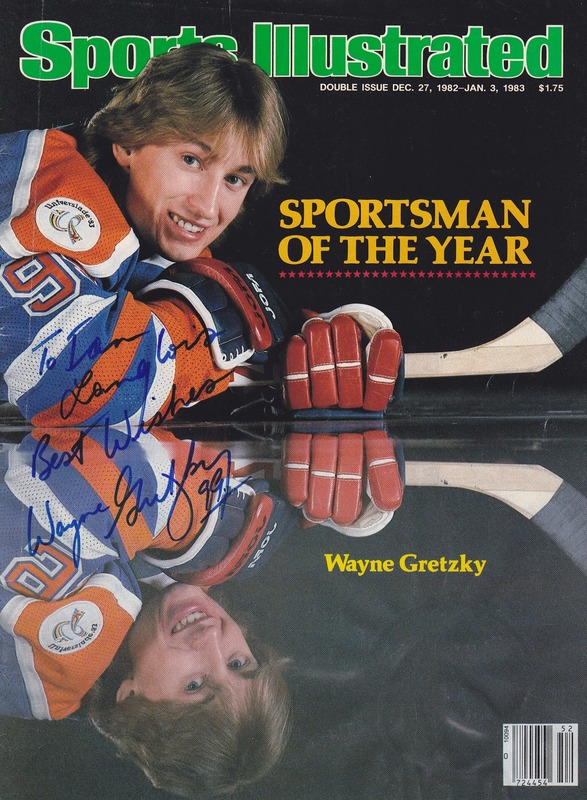 That's a magazine cover, right, that Gretzky signed for my eldest son when he was just a little guy more than 30 years ago) players have to retire somewhere else. Sometimes it’s a guy trying to hang on past his prime. Sometimes it’s about money or ownership. Sometimes it’s ego. Whatever, it would be a shame if Alfie ended up in, say, Boston or Philly. Not that he doesn't deserve a shot at a Stanley Cup, but like Sundin (who a lot of us hated see having to finish his career elsewhere), it may simply be his hockey destiny to have an Olympic Gold, among his other team-related international accomplishments, as a career highlight, rather than a Stanley Cup. It’s unlikely the Sens are winning a Cup in the next couple of years, as hard as they work. And that would be OK. It won’t diminish Alfredsson’s legacy in my mind. Guys get traded, I realize that. Not just Gretzky but the incomparable Bobby Orr finished his career elsewhere, in Chicago. Orr will forever be a Boston Bruin in my mind—and only a Bruin. But even he he couldn’t finish his career there. Mark Messier, Marcel Dionne, Guy Lafleur, Larry Robinson. All those guys finished their Hall-of-Fame careers somewhere else. You have to believe Alfredsson himself will receive serious Hall-of-Fame consideration. His raw “numbers” are pretty good (something like 400+ goals and 1,100 or so points, I think, maybe someone can fill in the blanks for me) but his inspirational leadership to the same team has meant a lot all these years in Ottawa. His playoff totals are pretty darn solid, too. He’s been a strong ‘plus’ player in his career. I hope most (including Leaf supporters) "opposing" fans will give Alfredsson a rousing ovation if he ever publicizes his intention to end his career, and if there is an opportunity for a final appearance at the ACC. I have no problem ‘disliking’, in fan terms, an opponent- if they give me cause. But there’s something to be said for honouring a worthy opponent, too. For me, Alfredsson has been that—in spades. I was never a fan of Alfredsson either. Specifically for the play on Tucker, the Sundin episode I felt was more a playful thing between countrymen. It didn't really make me think any more deeply than that. I think that he would be one of those players that I would love to have playing on my team, and hated having to face in important games. He is so willing to do whatever his team needs him to do. I greatly admire that quality in a hockey player. Daniel Alfredsson is going to be remembered when it is all said and done, as a remarkable player. Thanks for the effort you continue to put into VLM. You have made it a place that I am happy to say is the only place I go to discuss my favourite team. This is because of your efforts and the efforts of your other regular commenters. You make a conscious effort to be inclusive and kind in an arena where those qualities are lacking. Aspiring to be more than the lowest common denominator, is something you should be proud of. So thank you sir. Alfredsson is a guy I've come to admire, though it took some time, Jim. I agree- he will be well regarded by hockey historians. And thank you for the kind words about the site. That kind of feedback makes it feel worthwhile. There are certain players I have a really hard time respecting (like Carcillo, for instance - wouldn't ever want him on the Leafs), but, like you say, I respect the longevity, ability and intensity of the player. Alfredsson had to be around for this many years for me to say that, cause I really disliked the plays you mentioned (I also really disliked his ability to play so well)! He has earned respect and I find it to be a poor reflection on the sportmanship of fans who make a habit of booing any player just because they touch the puck (every time). It seems so unnecessary... why not spend your energy cheering or encouraging our own guys?! It would seem wrong for Alfie to be seen in any other NHL jersey, but IF he is thinking of coming back for another year, I could see him 'taking one for the team' that would be strengthened by his temporary departure (with a UFA re-signing in the offseason). It would make sense, but I hope it doesn't happen for 2 reasons... 1) I think he should be one of those 1-team guys if he's coming back next year, and: 2) I don't want the Sens to get stronger if they trade him! Current Sens Memories just doesn't sound quite right... I feel like I just entered and alternate universe somehow! Alternate universe, indeed, InTimeFor62. I won't make a habit of writing about my "favourite" Sens! I, too, hope he concludes his career in Ottawa. I know Ray Bourque went to Colorado, after for years declining an opportunity to "try for a Cup" with another team. That doesn't diminish him in my eyes, of course. It would just have been "nicer" for him to finish his wonderful career as a Bruin. 1. The player is dirty. 2. The player is very good, usually kicks your team around and you would love him on your team. I think Alfie is number 2. All his years with a Maple Leaf on his chest would've been better right? The hit on Tucker was an in-game thing and doesn´t define him or how he plays. The booing started out sincere I think, and then just turned in to the thing to do. I dont't think it´s a bad thing. It gives "atmosphere" maybee throws him off a bit, like chanting the oposing goalie´s name (not like last night though, it's better when everyone does it, not just 2 or 3 fans). Sloppy play again last night, but I like that we're winning those sloppy games. A good team wins alot of those kind of games. If that kind of play becomes a trend, then we need to start worrying. Well said on Alfie, portuguese leaf. We wouldn't have minded having him on our team! Yes, some sloppy play again. We're doing enough to win. Is that a normal mid-season lull (and fatigue) or something more? You forgot the accidental dump in shot that somehow found it's way to Neidemayer in the finals. As part of Leafs nation, I just dislike him period. Part of it is that he always compete and it always infuriates me that no one can ever ring his Bell consistently. Pun intended. That said, as much as I have a dislike for him, I would still like to see him end his career in Ottawa knowing what he means to their fan base. As for last night's game, the Leafs once again got all the bounces. The giveaways were atrocious and not one Leafs were immune. Puck battles were non-existent. Compound that with poor positional plays and it almost spell disaster if not for Reimer's timely saves. Ottawa should not have given the leafs that much trouble if the Leafs competed with the same level of tenacity that Ottawa displayed. It was rather concerning especially as some of the younger D seems to panic at the moment of trouble. I am less and less amour with Phaneuf's play and I truly believe that the minutes are getting to him. The quality minutes are just fewer and fewer each game. I suspect he is pacing himself given the minutes but the half hazard attempts at fighting for the puck is just too numerous to ignore. As much as I like the big bodies and physical play of Kotsa, Holzer and Fraser, they don't move the puck as well as Lyles or Gardiner. At times, they just seem like they are at a lost. With the understanding that they need the forwards to play better, a quick outlet pass can alleviate the pressure as well. Obviously if you're in your zone more than your opponent's, your chance of success is greatly reduced. The Leafs will continue to have problem with teams that forecheck well with speed unless they can get out of their zone efficiently. If yesterday's game was any indication, the Leafs will unlikely to have the same end result on the scoreboard against Boston tonight. I think most Leaf fans recognize, Lukas, that while we are playing well enough to win most nights in a poor Conference, there are obviously some areas where we need to improve. I have this lingering thought that the Leafs can't rationalize "demoting" a defenseman when they are winning, so Gardiner will have to wait until someone is hurt. He's not the saviour, but he can move the puck and more often than not, skate away from trouble. The whole roster will be under scrutiny come playoff time. There will be a lot less "open ice" (guys like Kadri and Kessel are just free-wheeling right now); the game will be much more physical and we won't be able to fight our way past teams. Flaws are always exposed in the playoffs- we've gotten away with a lot of mistakes this season. I hear what you're saying about the rationalization. True success requires objectivity and hard decisions. I believe in continual improvements and one should not be blinded by immediate success unless that spell long term success culminating into a championship. And because of that goal, there is more at stakes than simply winning a game here and there. There comes a time when a team must evaluate the prospect of success after the regular season. Maybe I am a little ahead of myself but I believe the Leafs are in the position that they must start to consider the possible playoff success and what must be done to be successful. I have a feeling that Carlyle is very aware of the same issue too. What really concerning is that they are not improving but rather regressing defensively. With the recent wins, it simply is hiding the problem that in the playoff will all be too evident. I don't believe Gardiner or anyone player can be a "saviour" aside from perhaps by nature, the goalie position. My suggestion were merely to illustrate alternative options in which the leafs deals with break out and forechecking. We're on a similar page, Lukas. I have to believe Carlyle is very well aware of our deficiencies. He sees them every night. And I don't sense he is getting carried away with wins against struggling teams. He knows what lies ahead when we reach the playoffs. Alfredsson is the perfect candidate to play the 'hated' player from a rival team. The bitter playoff history (mostly for Ottawa fans), the on-ice incidents, the skill level - it's these little nuggets that add to the legacy. As a hockey fan, it's important to have these types players to add that extra layer of drama and interest to the game. I feel we've lost a lot of that with the Leafs and Sens not being the playoff regulars they used to be, because it's really in the playoffs that these feuds are magnified. It may be interesting to note, Alfredsson spoke for Sundin at Sundin's Hall of Fame Induction ceremony. Wouldn't it be a kicker if Sundin spoke for Alfredsson at his induction? Alfredsson may not be a first ballot HHOF'er, but I do believe he deserves to be there, and eventually will be. I can't say there's someone on the Sens right now that will fill Alfredsson's shoes once he leaves as the default player to boo/hate on the team. But, there's a guy on Montreal which I'm starting to hate, and that's Max Pacioretty. I'd love to see these rivalries re-ignite. Much like what's been going on with Philly/Pittsburgh these past few years. Without rivalries, and these players to "hate" in sporting terms, where's the passion and drama? Cheering for our team is fun, but cheering against somebody is part of the fun too, especially when respect is part of the under-pinning of our feelings. I don't like Lucic, but I respect that he is a tough, grinding opponent with some skill. I wish we had him. But I can "hate" him now. When he retires, we can (if we choose) applaud him, like Terry O'Reilly and Cam Neely. I hated them, but goodness, they played the game the way I like to see it played. On an entirely unrelated note (unless the number 11 changes all that), there was a suggestion on Sportsnet that the Leafs should use Stompin' Tom Connors' Hockey Song as the 'goal song'... wondered what you thought about that? Oh ya... the 11 connection came in the Leafs video from our favoured early 70's team (posted with the song) that featured some enjoyable clips including Guy Trottier, who I had all but forgotten, until I saw him in that video. He was rather small and quite skilled, but just made me thing we had some other Eleven's that I liked before Jay McClement... he only played a couple seasons in Toronto before jumping to the WHA for a few years. I wonder if you have any good memories of his time with the Leafs? Trottier was part of my favourite all-time Leaf teams, that 1970-'71 squad under the direction of General Manager Jim Gregory. As you say he was really (really) small, but could skate well and could finish. He did not get big minutes but still managed to score a bit. It would be interesting to see what a guy like that could do nowadays, because while there were some good small players back then (heck, Bobby Lalonde was maybe five feet four inches) it was still a league for guys bigger than Trottier. Yeah... the song was never a favourite of mine, just 'well known'. I was thinking of some excerpt where the fans could sing the goal scorer's name (instead of Bobby scores), during a short season to honour a proud Canadian and iconic song. Thanks for the comments on Trottier, too. I know you really liked that team, too.